This post comes from Roger Mann. During my abuse, and for years after I left home, I picked up some bad habits. I don’t know if it was the PTSD or being trained to see others as objects that might be useful or harmful to me. I developed a hyper alertness when out in public. I tended to notice every male around me and would check them out for hostile or friendly body language. Most times, depending on the venue, it was indifference, but not always, and it was those times I would seem distracted to whomever I was with. Mostly it was because I was checking out where the bathroom was, where the nearest exit was, and trying to find a seat against a wall. Also, I became almost obsessed with my body. I wanted to know every inch, learn about all its functions and what sort of sensations and scents it carried. Certain parts like knees have their own scent. Of course that led to a curiosity about everyone else’s bodies too, which got me in trouble on several occasions. Some people are militant about their modesty. 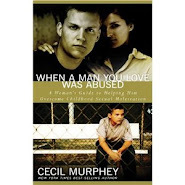 Abuse changed my whole perception on the world around me in ways I couldn’t appreciate for decades, and after many counseling sessions, I still have a few quirks, which I won’t share here. But I have come to realize that much of what I believed was not true and even dangerous for me. I’m learning a healthier way to navigate life these days, and I’m more comfortable with who I am. I’ve learned to listen to my wife’s suggestions and watch people’s reactions to things I say and do so as not to be thought weird. I can look back on many cringe-worthy situations that would never have occurred if my sensibilities had not been so horribly messed with. A note from Cec's assistant: Cec's publisher sent him a box of bookmarks for his upcoming book, More Than Surviving. If you would like to help Cec by distributing some of the bookmarks, please contact him at cec.murp@comcast.net and give him your mailing address. Thank you! This is my story. It is not the same as your story. But I hope my story will encourage you to more fully live your story. 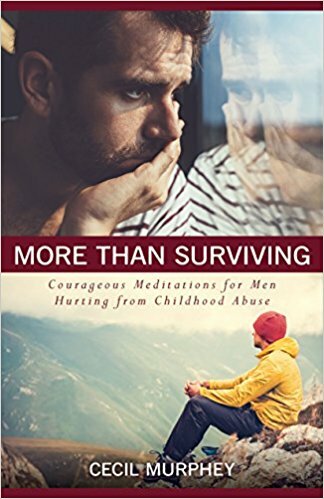 I had to fight tears as I heard his words; his words felt like a mockery of my healing journey from abuse, but more than that, they exposed his own battles. My brother knows the pain of trauma in his life, but shows little evidence of facing that pain. His “just be over it” statement, rather than being an expression of callousness towards our neighbor, speaks of the harshness he feels towards himself; an expectation that by now he should “just be over” the pain of his wounds. Those of us who have entered the healing journey know that we will never “just be over” our wounds. Rather, we have embraced the hard work of dealing with those wounds. We have accepted that our journey will include countless tears, frustration and anger. We know we must continually be honest with ourselves, with others, and with God. We face the raw truth of how we were hurt and how we have caused hurt in attempts to sooth our pain. But as the tough work of healing progresses, we eventually realize that we have more peace—even if it is fragile—than we once thought possible. Years ago, I'd only been working on my recovery for five years or so, and all I wanted was to get fixed and get on with my life. Once I was "normal" I never wanted to hear about this stuff ever again or anyone else who had experienced it. It was ugly, dirty, shameful, and socially unacceptable. I laugh now, because once I began to accept what happened to me and deal with it I became aware and in contact with others who shared so much of what I felt and was going through. It tugged at my heart, and I found myself responding, replying, and supporting them in their struggle too. I was not alone. It was not my fault. I needed to share those truths with others who also were hurting. I couldn't leave them. The site I most frequent now I have two threads that I post on for my personal stuff—the single men's forum and the married men's forum. I have noticed I have six times the views of the next most popular thread. God has blessed me with insight and the compassion to articulate it. I guess I know why. Someone needs to say perhaps the things that I say and to share the hurt and victories that I experience. And so I stay. Even though my wife thinks it's too much, I know I am needed there on those forums as His voice. Deep down I still wish I could walk away but I know I can't. I'm not done yet. God's not done with me yet. That said, we both feel I should accept your offer and do what I can to help others along this journey, if only by pointing out what not to do. Let me know where to go from here and I will do my best to send you what I can. I have treasured your emails for a long time now. I have been feeling prompted, in my own healing, to reach out. This email is, perhaps, the straw that broke the camel's back. Identification is a power healing step, one I have been feeling my own heart inviting me into. My first public admission was with one of my professors in Bible college. I later started a support group with this safe sojourner. This group brought more self-disclosure, more safe solidarity, and therefore, more disruptive naming of pain that was necessary for healing to occur. We used to always say in the group, "You cannot heal from what you have not named." In many ways, my journey of healing has been a process of learning my name, and naming myself. First, I’ll tell you a story. For more than 30 years, I’ve made my living as a professional writer (primarily a ghostwriter). 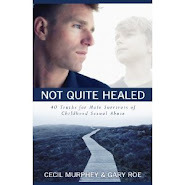 Back in 2010, male survivors contacted me after I spoke at conferences. By then, each time I made oblique references to my abusive childhood. Often, I was the first person he had ever told. I felt those men gave me a precious part of their trust and I didn’t want to violate it. And, as many of you know, trust is hard for us. Second, those experiences made me sense the need for a blog—a safe place for hurting and healing men. That’s why I started MenShatteringtheSilence. The blog is to offer insight and encouragement for sharing our lives with each other. This isn’t a chat room or a typical sharing group. Please don’t send personal messages to other blog readers. I want the entries to be of a general nature and focus on healing and growth. Third, I’m a serious Christian, and several blog readers don’t embrace the same faith. I don’t want them turned away because of the posts. That’s not to ignore God in our lives, but to ask you, the readers and commenters, to be sensitive to them. Some of you experienced sexual assault by those individuals who were supposed to represent God—pastors, Sunday school teachers, youth ministers. I want this blog to be the kind where any hurting man can find healing for his soul. Fourth, if any of you want to talk to me personally, you may email me at cec.murp@comcast.net. If you want to make direct contact with someone on the blog who gives his name, I’ll send your request to that person and leave it up to him whether to respond. Finally, thank you for reading this blog. I’ve been on the healing path a long time. I’m still learning and growing when I read your comments.